Other projects - Discovering new planets! #Twima2 is one of the collaborative projects that I have the opportunity to be part of. 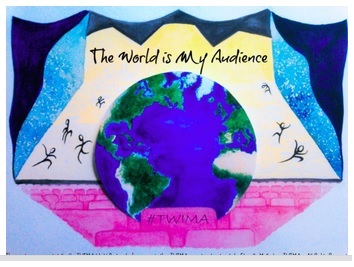 #Twima2 was born out of the desire to compile a collaborative iBook. A book of dreams. Teachers and students from all over the world are the writers of this massive iBook called The World Is My Audience 2: Dreams Around The World. Each of the participants had to write a personal dream, an actual night dream or a dream for the world. And now, in this second stage, each dreamer have had to choose a dream from the iBook that you can read here. Once we have the dream chosen, we have had to turn them into multimedia for the iBook. I chose a dream called "Summer" written by Champ, a student from Webb City, Missoury. He wrote a simple and beautiful poem about summer. To make the media for this lovely dream, I used an online tool to make comics without having to draw called Pixton. Pixton is a very complete tool and easy to use for those that are begginers. I really like it because it is very intuitive and the result is awesome! Here it is the result! I hope you like it. Today I had the opportunity to assist to Moodle MOOC6 where all my classmates and I were presenting our E-publications. It was an amazing experience and very excited for us as we were the focus of the online conference. Unfortunately, I do not know what has happened to my webcam/microphone that I could not be able to present my E-publication. I am so happy all of us could make it and all of us have a E-publication made by ourselves. I do not want to finish without saying expressing my gratitude to the person that have made all this possible: Mª Jesús Garcia, a great teacher that has been very patient with us. Thanks for everything! It was a pleasure to be with you during the whole module.